Drew Allison Carey, known as Drew Carey, is an American actor, comedian, game show host, screenwriter and television producer. How rich is Drew Carey? Currently, Drew Carey’s net worth is estimated to be a remarkable $180 million. Drew Carey has acquired most of his wealth due to his appearances on television. Born in 1958, in Cleveland, Ohio, Drew Carey started his comedy career in 1985 as a stand-up comedian, and at the same time wrote jokes for David Lawrence’s radio show. Carey then won an open-microphone contest and became Master of Ceremonies, an official host of staged events, at Cleveland Comedy Club. However, Carey’s first major public appearance was in 1988, in a show titled “Star Search” where contestants competed in a variety of entertainment genres. Several years later, in 1991, Carey appeared as a guest on “The Tonight Show Starring Johnny Carson” where he impressed the host Johnny Carson, as well as the audience with this stand-up comedy. Carey also starred in several supporting roles on TV shows and films, including “Coneheads”, “The Good Life”, “Robots” and “The Aristocrats”. However, it wasn’t until 1995 and the creation of “The Drew Carey Show” that Carey received public recognition. “The Drew Carey Show” was a comedy sitcom, and could be considered Carey’s breakthrough in the entertainment business. Initially, Carey earned $60 thousand for one episode, but later the sum rose to $300 thousand, significantly increasing Drew Carey’s net worth. The first few seasons of the show were highly successful and profitable, and by the final season, Carey was earning $750 thousand per episode. Unfortunately, soon enough the production costs began to exceed the earnings, and, as a result, “The Drew Carey Show” was cancelled in 2004, after 9 seasons. However, Drew Carey made a successful comeback as a host for an improvisational comedy show “Whose Line Is It Anyway?” with Ryan Stiles, Wayne Brady, and Colin Mochrie as primary performers, as well as recurring guest stars, including Robin Williams, Lauren Cohan, Whoopi Goldberg, and Stephen Colbert. The show ran until 2007, but was put on hiatus and later picked up by The CW network with Aisha Tyler as a new host. 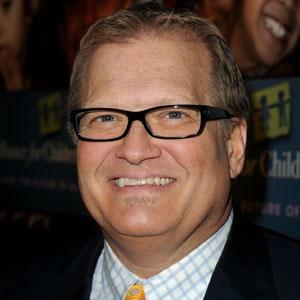 Even though Drew Carey generated most of his net worth due to these two shows, he continued his successful career with other projects. Currently, Carey is a host of the famous game show “The Price Is Right”, replacing the former host Bob Barker. In addition to his on-screen performances, Drew Carey is a known photographer and writer as well. Carey is a press photographer for the U.S National Team of soccer, and sells his images under the pseudonym of “Brooks Parkenridge”. In 1997, Carey published an autobiographical book titled “Dirty Jokes and Beer: Stories of the Unrefined” where he shares his childhood memories and problematic experiences. An actor, comedian and a host with an estimated net worth of $180 million, Drew Carey actively participates in charity events. He supports libraries and has donated large sums of money to Ohio Library Foundation, and Cleveland Public Library among many others. 1 [on hosting 'The Price is Right] All through my twenties I was broke. I didn't start making money until I was in my thirties doing stand-up. I really don't take money for granted. I have a lot of empathy for people on the show. I know what it must mean for them to win $5,000, which doesn't seem like a lot of money to give away on a game show nowadays. But it's a lot of money. 2 [on his 1991 appearance on the Johnny Carson show that was a major career booster] I think the whole routine got him. But the one that really got him was a bit about eating a chili dog at Denny's, and having all the cholesterol march right down to my heart, telling the lettuce to get the hell out of the way. I think he was holding onto his desk for that one. 3 One day I was running around playing with my son Connor when afterwards I was sweating, tired and out of breath. I was embarrassed that something as enjoyable as playing with my son was so tough for me to do. Immediately I started an extensive diet and exercise plan. It completely changed my life and helped cure my Type-2 diabetes. 4 Libertarians are essentially what the Republicans were 30 years ago. Abraham Lincoln, Teddy Roosevelt, Richard Nixon, Ronald Reagan. They'd all fit more under the Libertarian label than the modern day Republican label. 5 I looked at game show hosting as the bottom of the totem pole, one step away from infomercials. I never watched them myself. However, it's been a lot of fun. We try out new things and keep a lot of the classic elements people remember. I enjoy getting to know new people and seeing them win. 6 [on Johnny Carson] If he liked you a lot, he would wave you over. I'm not even saying this is a joke but people talk about the feeling of the Holy Spirit going through you and your body that something's changed in your life forever. Being called over to the couch on the 'Johnny Carson Show' was the closest I came to that. 7 You can buy liquor in a drive-thru store, but you can't smoke a joint in your own damn house. 8 (In 2007, on succeeding Bob Barker as host of The Price Is Right (1972)) This show fits me like an old shoe, I'm telling you, I love doing it, I'm really happy here, I feel like I belong here, audience certainly feels like I belong. 9 I honestly think that it automatically hurts me if I said that I supported the war in Iraq and I support the troops. That automatically kills me for getting a bunch of movies, a bunch of TV shows. People don't want to hear from me. 10 On government: The less the better. As far as your personal goals are and what you actually want to do with your life, it should never have to do with the government. You should never depend on the government for your retirement, your financial security, for anything. If you do, you're screwed. 11 Responding to a question about his childhood: "Weirdo. Weirdo. Underachiever. Weirdo. Weirdo." 12 When asked if he enjoys being famous: "Sometimes I like it, sometimes I don't. I've always been a people watcher. I like to go to malls and just sit, and I can't do that very easily anymore." 1 Is known for being extremely polite and courteous to waiters and staff and leaving tips of well over 100 percent. 2 Was homeless for a brief period in his early career and had to sell the plasma in his blood to afford food. 6 Made his first television appearance at the age of 34. 7 Worked as a bank teller and waiter before becoming a comedian. 8 Started his comedy career at the age of 27. 9 As a minority owner of the Seattle Sounders, Carey helped establish the only band in Major League Soccer, Sound Wave. 10 Went on a significant diet and exercise regime in 2010. The results were he eliminated his type-2 diabetes and lost close to a staggering 100 pounds. 11 One of his first appearances was on 'The Tonight Show' starring Johnny Carson. Carey credits Carson for helping to launch his career. 12 Is a WWE Hall of Famer. 13 As a little kid, he was a fan of the following shows: The Beverly Hillbillies (1962), Bewitched (1964) and Batman (1966). 14 Best known by the public for his starring role as the title character in The Drew Carey Show (1995) and as the second host of The Price Is Right (1972). 15 Had never watched not a single episode of The New Truth and Consequences (1950) nor The Price Is Right (1972), the two shows that were hosted by Bob Barker, but had to be taught every description of the game after Barker retired. 16 Is public face and owner of Major Soccer League team Seattle Sounders. 17 Holds the record for the most money won on the celebrity version of Who Wants to Be a Millionaire with $532,000 won during two appearances on the show. During his first appearance, he won $500,000, which has only been equalled by two celebrities - Rosie O'Donnell, and Norm MacDonald. During his second appearance, he left with $32,000. 18 Was selected out of 13 finalists to replace Bob Barker, as host of The Price Is Right (1972), who retired in 2007. At first Carey turned it down, but when CBS approached him a second time, while negotiating a deal, he accepted it. 19 He is a self-described libertarian. 20 In March 2008, Carey became the first US game show host to award a one million dollar cash prize on three separate game shows. The first instance occurred on "Pepsi's Play for a Billion", which aired in September 2003. The second incident happened on the premiere episode of "The Power of 10" in August 2007, while the third was won on a primetime episode of "The Price is Right" (Drew's first nighttime episode, March 2008). In addition, a $1 million prize has been awarded in two subsequent episodes of "Price". 21 Follow riots from Rangers fans and some of the team's players acting in an unsporting manner, he changed his loyalties from Rangers to Celtic saying: "It's still Glasgow, just a little greener and with proper fans.". 22 Is a big Cleveland Browns fan. Introduced the team upon the first game of the 1999 season, when it the Browns returned to the NFL. 23 Host of the two biggest-money games in television history. In 2003, he hosted Pepsi Play for a Billion (2003), a game show special that offered the ultimate $1 billion prize. In 2007, he became the host of Power of 10 (2007), in which the potential prize is $10 million. Both shows were produced by Michael Davies. 24 His hand was injured on the set of The Price is Right when his hand got jammed in one of the turntable walls. 25 Engaged to Nicole Jaracz, a recent graduate of culinary school, proposed October 9, 2007. 26 When his The Drew Carey Show (1995) wound up being a major surprise hit on TV, he was given a Porsche by the production company. He purportedly walked out on the stage of the set, asked, "Who here has got the worst car?" When one of the stage hands spoke up and said he didn't have a car, Carey threw him the keys to his old Miata (source: Esquire Magazine Interview). 27 Was the first ever celebrity to enter WWE's Pay-Per-View Royal Rumble. He eliminated himself when the next participant, the seven footer Kane (Glenn Jacobs), came out. This became one of WWE's greatest moments in sport's entertainment history. 28 Author of the book "Dirty Jokes and Beer". 31 Likes "The Sims" series for PC. 32 Is a wrestling fan. 33 Is an avid fan of football (soccer). He says he got into it playing FIFA and learnt the rules ("Soccer for Dummies"), so he could become a "true fan". 34 His favorite soccer team is Glasgow Celtic. But he was once a fan of their city rivals Rangers. 35 His name is mentioned in the song Ohio (Come Back To Texas) by Bowling for Soup. 36 Considers the writings of self-help guru, Dr. Wayne W. Dyer a major influence in his life. 37 Received an honorary Ph.D. from Cleveland State University in 2000. 38 A self-professed "computer geek" because of his love of video games and the internet. 39 Received a Star on the Hollywood Walk of Fame on Friday, 21 February 2003. Appropriately enough, the star of this former Marine is located directly in front of The Supply Sergeant; a Hollywood fixture for decades. 41 Bought his childhood home with his first paycheck from The Drew Carey Show (1995). 44 Competed in the World Wrestling Federation's 30-man "Royal Rumble" battle royal match on January 21, 2001. He eliminated himself shortly after entering the match as the fifth participant. 46 Played in his high school marching band. 47 Underwent lasik surgery to correct vision. Currently wears trademark glasses as a "prop". 48 Was in the US Marine Corps. 49 Father died when Carey was 8, spawning years of depression. Attempted suicide on many occasions. Geppetto 2000 TV Movie performer: "Toys", "Empty Heart", "And Son", "Just Because It's Magic", "Since I Gave My Heart Away"
The Drew Carey Show 1995 TV Series performer: "Moon Over Parma"
2003 Star on the Walk of Fame Walk of Fame Television On 21 February 2003. At 6664 Hollywood Blvd.